Although the Common Core and C3 Framework highlight literacy and inquiry as central goals for social studies, they do not offer guidelines, assessments, or curriculum resources. 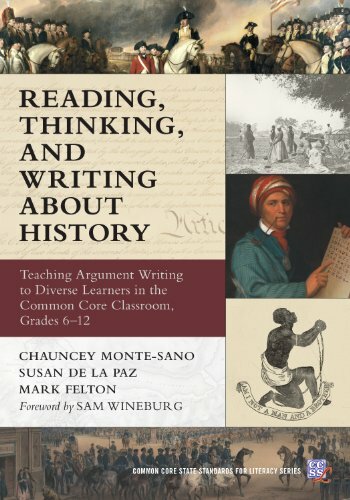 This practical guide presents six research-tested historical investigations along with all corresponding teaching materials and tools that have improved the historical thinking and argumentative writing of academically diverse students. Each investigation integrates reading, analysis, planning, composing, and reflection into a writing process that results in an argumentative history essay. Primary sources have been modified to allow struggling readers access to the material. Web links to original unmodified primary sources are also provided, along with other sources to extend investigations. The authors include sample student essays from each investigation to illustrate the progress of two different learners and explain how to support students' development. Each chapter includes these helpful sections: Historical Background, Literacy Practices Students Will Learn, How to Teach This Investigation, How Might Students Respond?, Student Writing and Teacher Feedback, Lesson Plans and Materials. Chauncey Monte-Sano is associate professor of Educational Studies at the University of Michigan, and coauthor of Reading Like a Historian.Susan De La Paz is associate professor of Special Education at the University of Maryland.Mark Felton is professor of Secondary Education at San Jose State University, San Jose, CA.